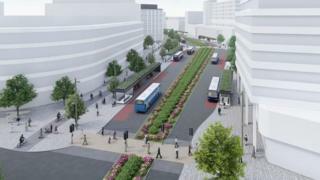 A new bus-only boulevard could form part of the redevelopment of Swindon's town centre. Plans to close off a section of Fleming Way and knock down the current bus station are being proposed. Swindon Borough Council is to bid for £25m of government funds for the £30m scheme. The current underpass could be removed and replaced by a series of pedestrian crossings, with a cycle path running alongside Fleming Way. These cycle lanes would complete the link between the Eastern and Western Flyer routes. Dale Heenan, Swindon Borough Council's cabinet member for the town centre, said: "Town centres can no longer be completely reliant on shops to survive, and these projects are key. "Sorting out the bus station and Fleming Way is one of the top three problems we need to solve.. along with a new cultural quarter and finding a sustainable use for the Mechanics Institute. "The improvements at Kimmerfields have been a priority for many years but a lack of funding has held back progress." If the council gets the funding it would take three years to build and a temporary bus hub would be created next to the Wyvern Theatre.